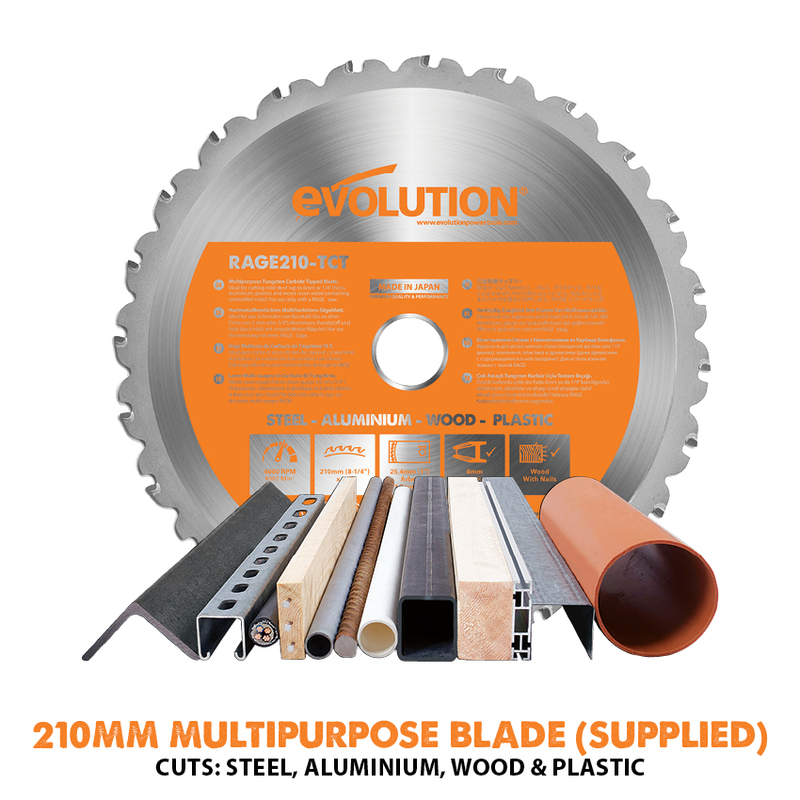 Utilising patented Evolution RAGE® multipurpose cutting technology. 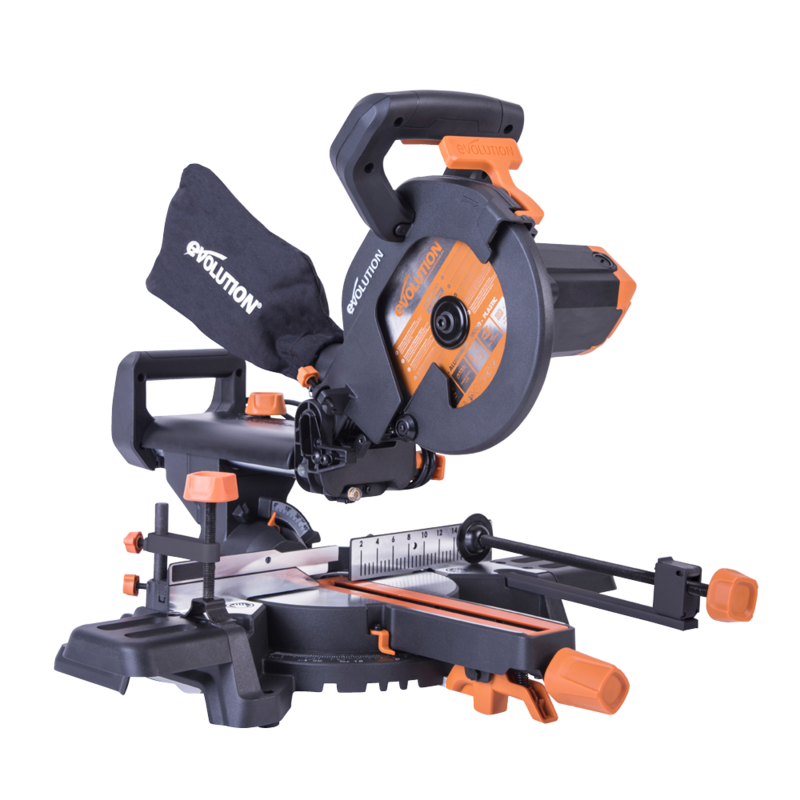 This compound mitre saw is optimised to cut mild steel, non-ferrous metals, wood, even wood with embedded nails and plastic with a single blade. 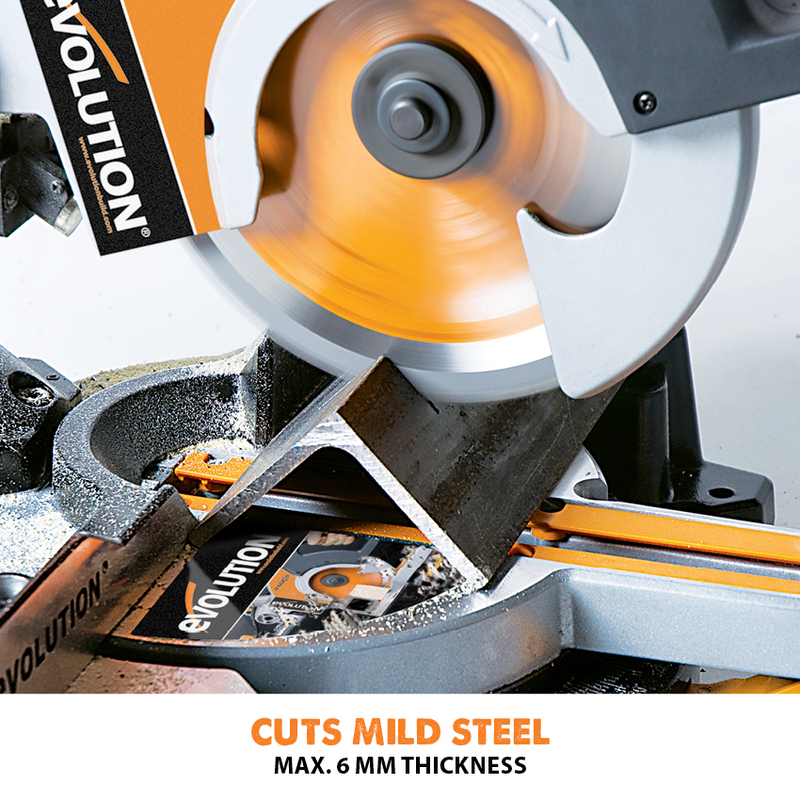 No blade changes = Faster work! 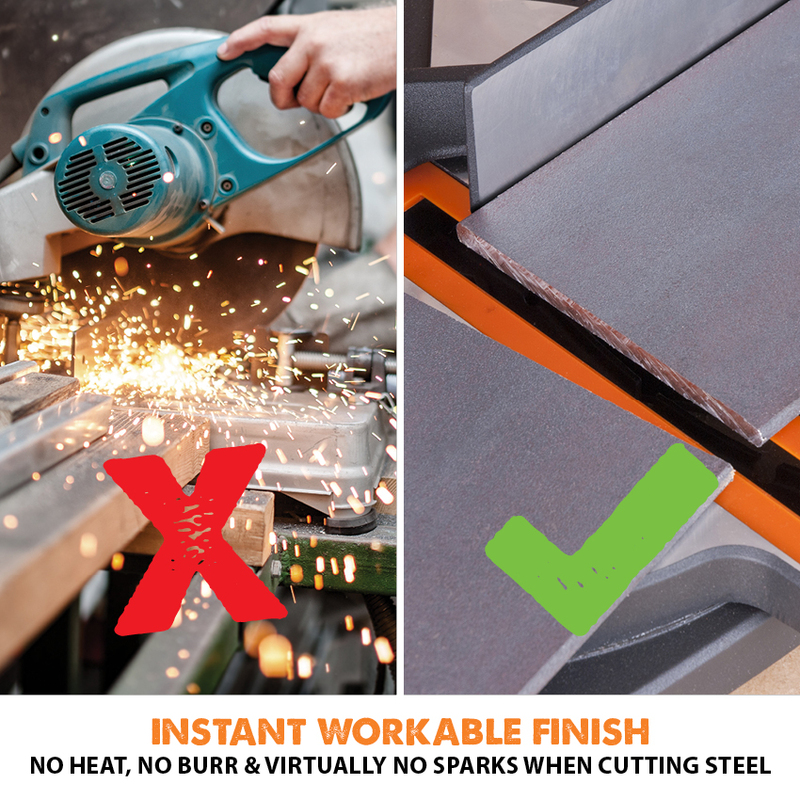 It is safer, faster and more economical than abrasive metal cutting saws - when cutting mild steel the saw produces no heat, no burrs and virtually no sparks. 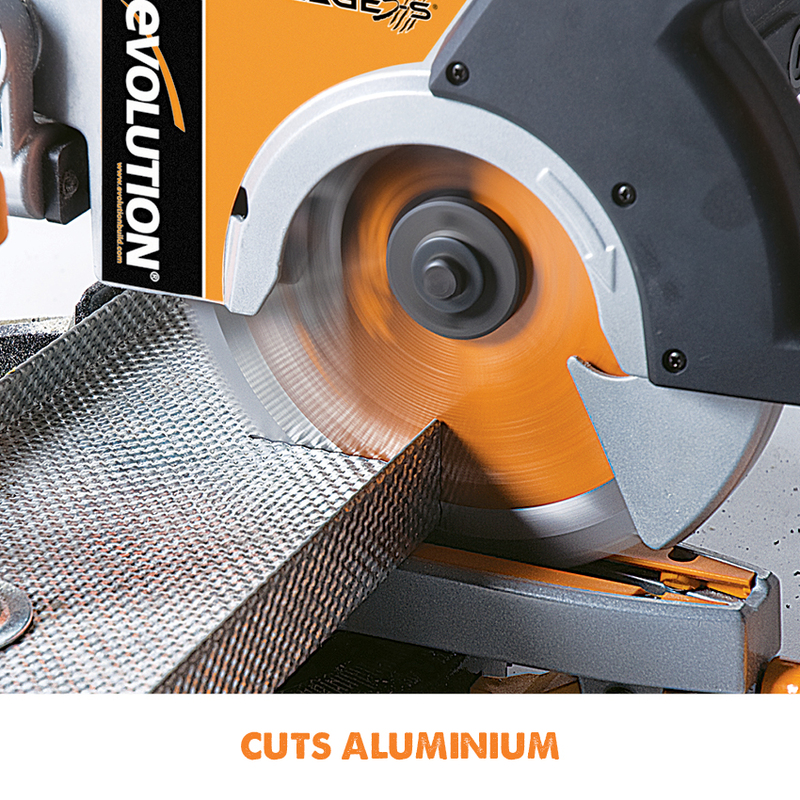 The cuts are clean and cool to touch, creating an instant workable finish. 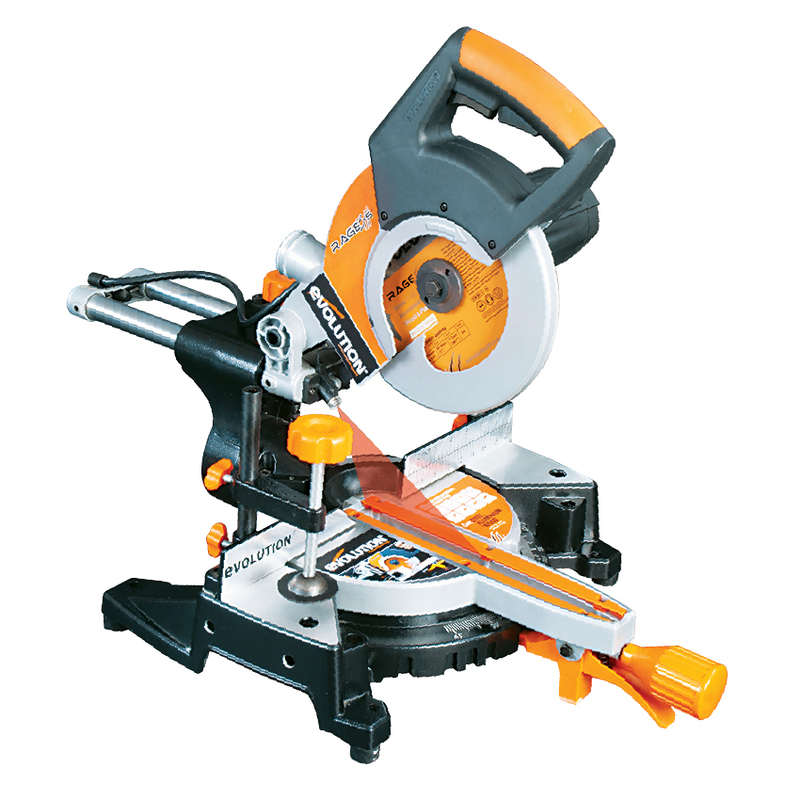 The saw is not cutting at the correct angles. Check the blade for damage. 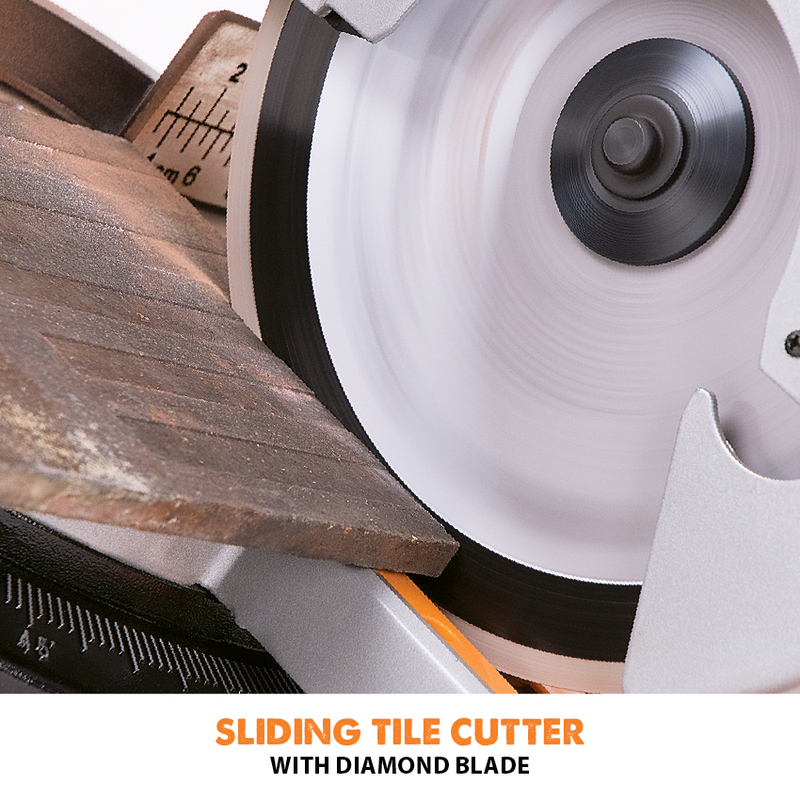 If blade is not parallel in the table cutting slot, the bevel block will require adjustment. See the manual for further instructions. 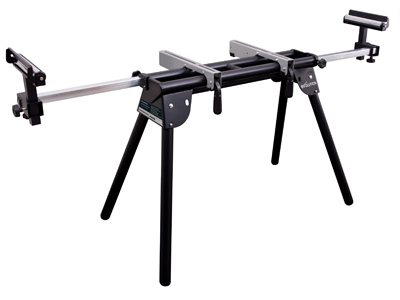 How do you loosen the blade fixing bolt? 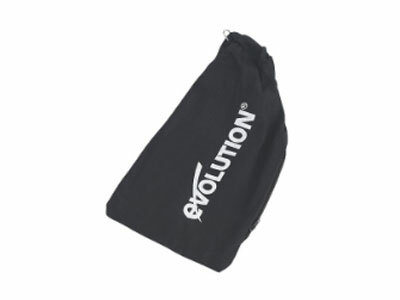 It is a left-handed thread, turn in a clockwise direction. What do I do if the machine has stopped or there is no power. Check to see if the laser light works, if yes, first remove the power supply from the mains and check the carbon brushes inside the motor housing. Remove the carbon brushes and clean with a dry cloth and then refit. Plug the power supply back into the mains and retry. If the machine still has no power, then it’s most likely to be the printed circuit breaker at fault. If the laser light is not working, check the fuse in the plug is fitted correctly and check the power cable for continuity. 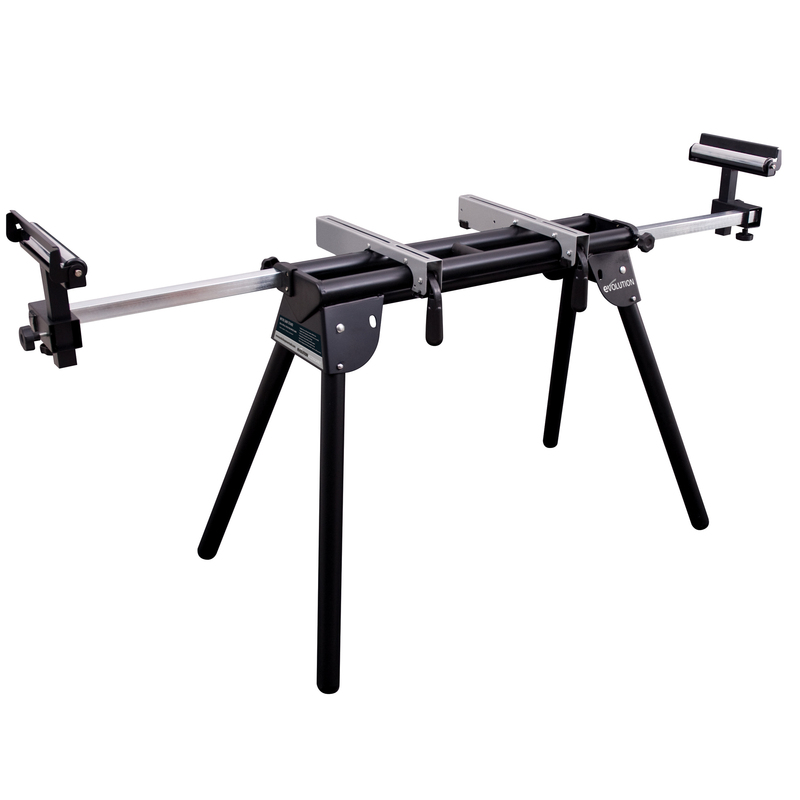 How do I safely cut steel? 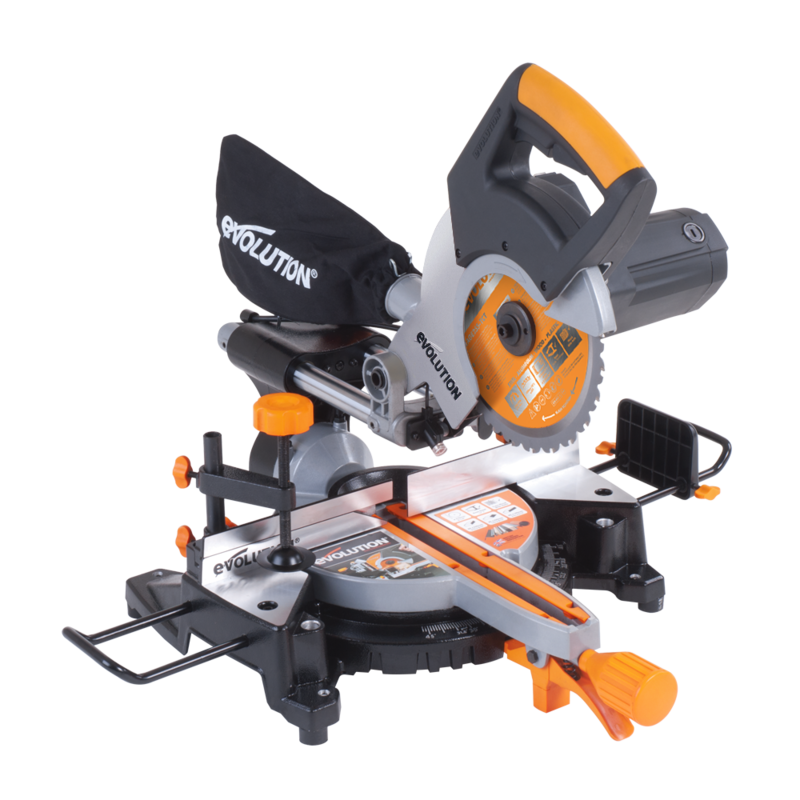 Watch a video on how to safely cut steel with this saw here. 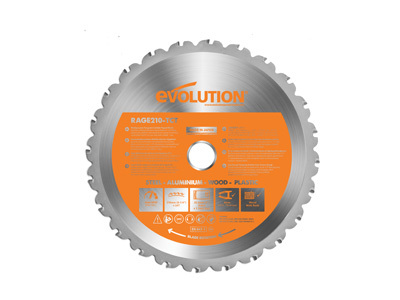 What should I do if the blade stops spinning when cutting? 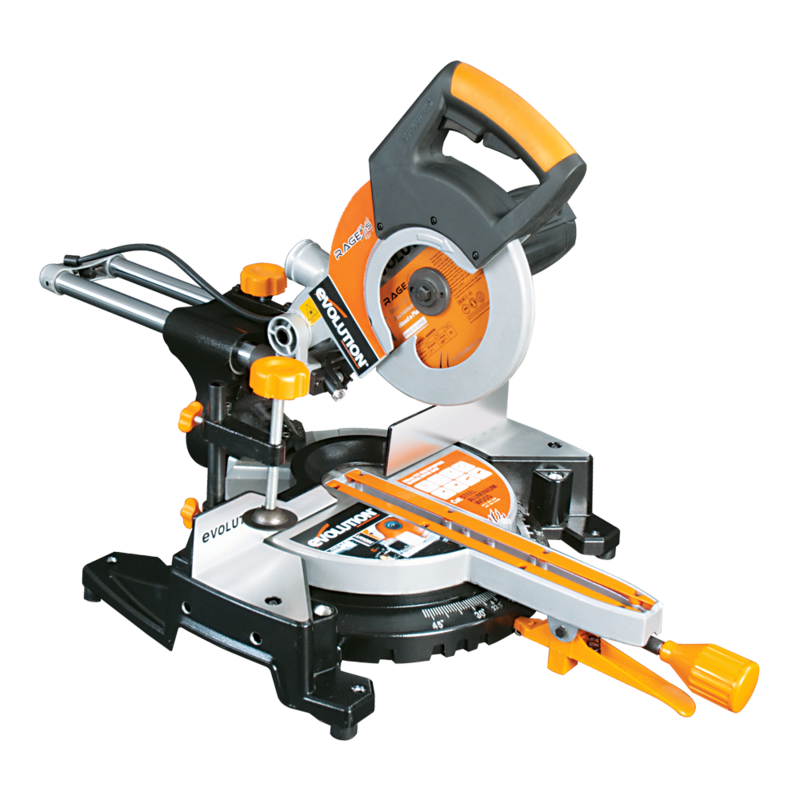 • If the motor still runs and sounds normal remove the blade and refit. • The gearbox is possibly faulty and may need repairing. • If the motor still runs but sounds noisy a new armature and gearbox may be required. 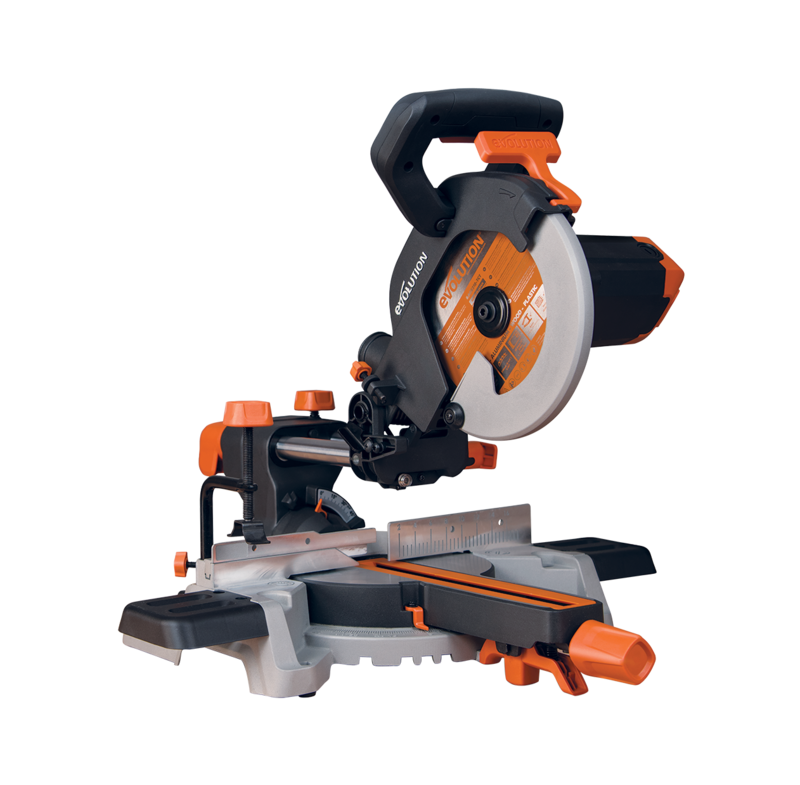 • If the full machine shuts down in the middle of cutting, this may be due to a damaged blade, which will cause an overload and the electrics will shut the machine down. Replace the blade. 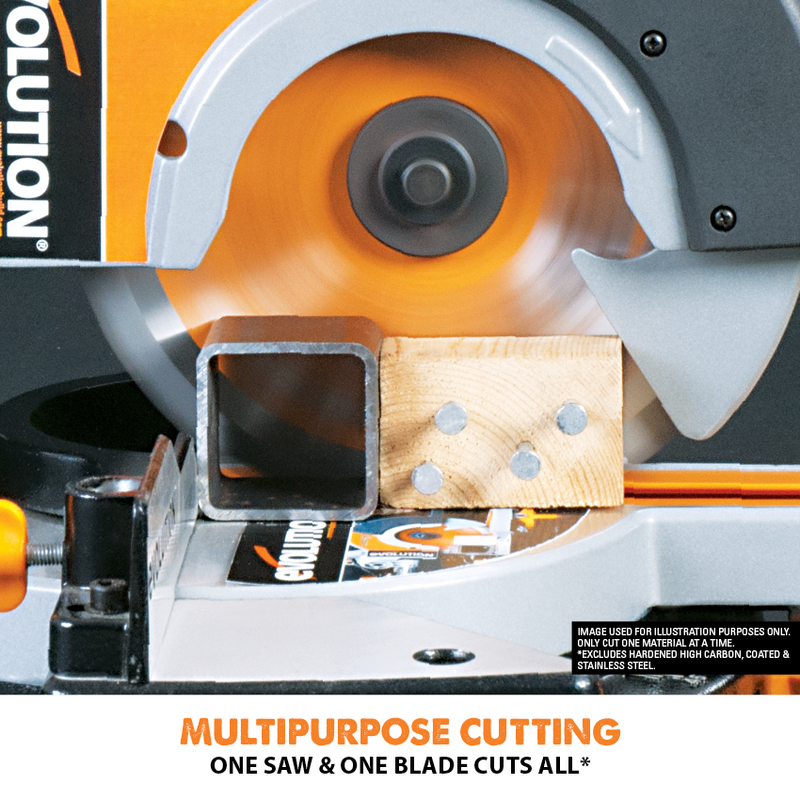 The head of the machine will not pull down or the blade guard will not return. Check the guard linkage is still connected and working - See the operator’s manual. Check that the head max height screw is tightened up correctly and not missing. 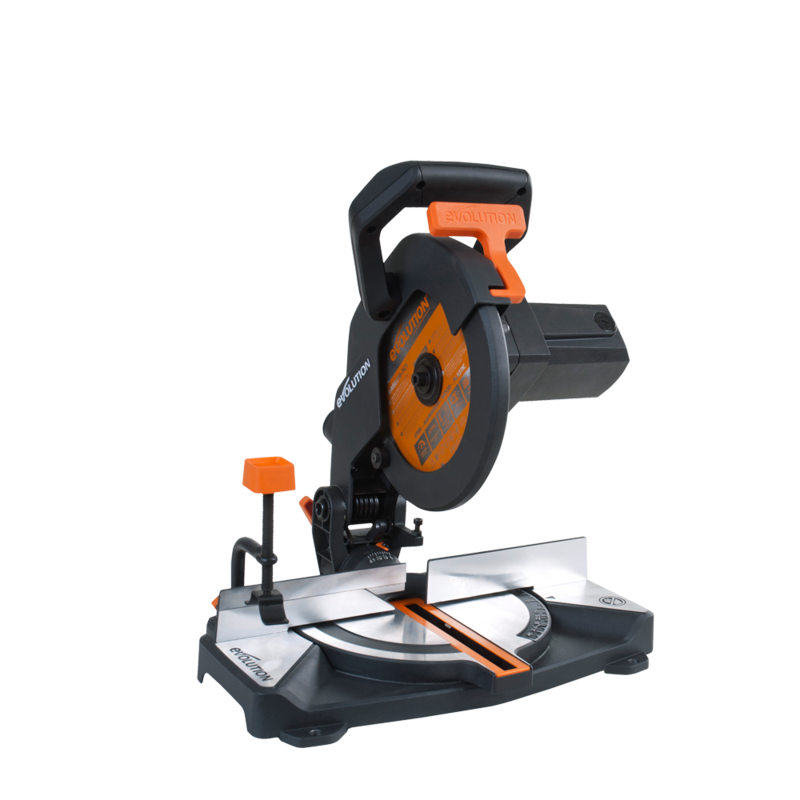 What materials can this saw cut? 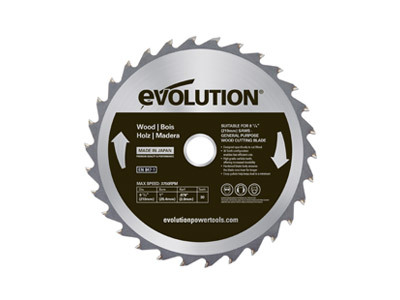 When fitted with an Evolution 210mm Multipurpose TCT blade this machine can be used to cut: Wood, Wood derived products (MDF, Chipboard, Plywood, Blockboard, Hardboard etc), Wood with embedded nails, 50mm mild steel box section with 4mm wall at HB 200-220, 6mm mild steel plate at HB 200-220, Copper, Plastic and many more materials. 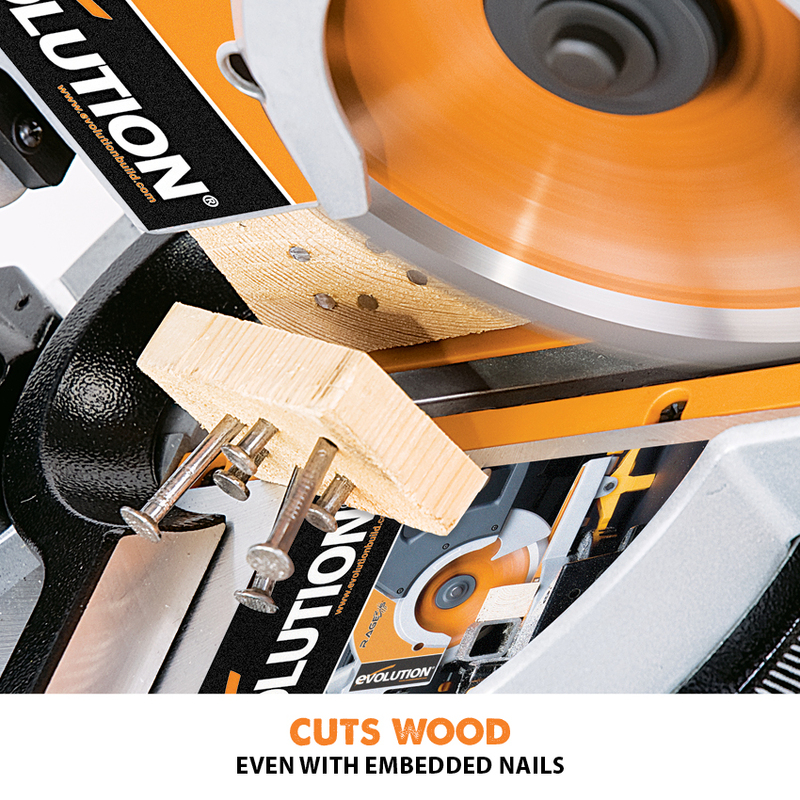 Note: Wood containing non galvanised nails or screws, with care, can be safely cut. 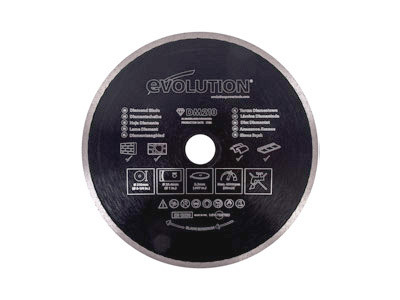 Note: For cutting stainless steel we recommend Evolution dedicated stainless steel blades. Please read all safety warnings and instructions in the operators manual included with the machine. Bringing innovation to the job site.